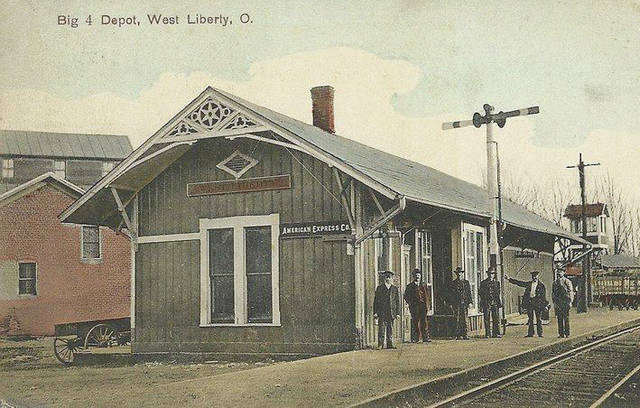 This old postcard features the Big 4 Depot in West Liberty. 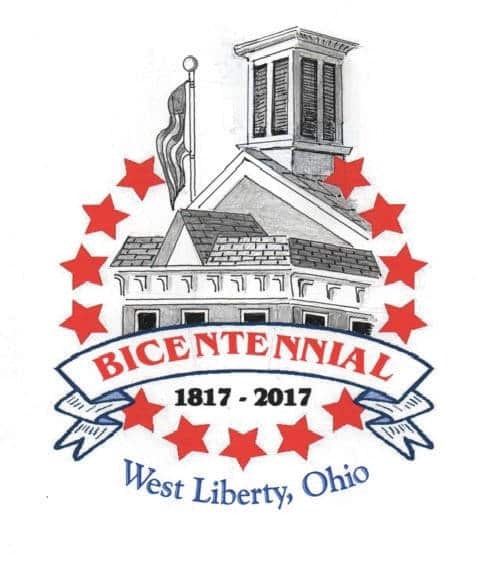 WEST LIBERTY – West Liberty is ready to celebrate its bicentennial July 6-9. Despite its size, the village is rich in history. John Enoch arrived in the area to prospect for gold in 1815. He built a house and a gristmill on the Mad River and Mac-O-Cheek Creek. The settlement, then known as Enoch Mill, grew as pioneers frequented it. In 1817, the settlement had grown and was established as West Liberty. In 1834, the village was incorporated. Today, West Liberty’s history can be explored through its natural and historic attractions. Visit Ohio Caverns to explore the natural beauty of the valley, and drop by the Piatt Castles to explore the history of West Liberty people and land. For a complete schedule and more event info visit mywestliberty.com, click on the Bicentennial logo, then on Schedule of Events. Various food vendors will be in downtown West Liberty 4-7 p.m. Vendors include My Flying Pepper Food Truck, My Little Cupcakes and Plank’s Pizza. Mt. Carmel Friends Church will provide free water. Enjoy live musical entertainment at The Grove 4-7 p.m. The Bicentennial Celebration Kick-off is at 7 p.m. at Town Hall. At dusk, an outdoor movie will be shown at the Town Hall. Bring an outdoor chair. At 2 p.m., hear stories of the village’s past at West Liberty History Story Time at Lions Park. Visitors are advised to bring outdoor chairs. The event is for all who wish to share and/or hear stories about West Liberty, including the ones not in history books. A Hog Roast is planned for 4-7 p.m. in Shelter House 1 at Lions Park. Willie’s Tug of War is at 5:30 p.m. Groups will compete across the creek at Lions Park during the 50th anniversary of this event. At 6:30 p.m., there will be an Ohio Caverns Hot Air Balloon Launch, if weather permits, at Lions Park. Listen to music at Shelter House 1 at Lions Park. Musicians will include the Green Hills Kitchen Band at 7 p.m. and the Home Strings Youth Dulcimer Group at 8 p.m.
Other events include a beard and mustache contest, open to Logan and Champaign county residents. A Sky Lantern Launch will take place at dusk at the Lions Park. The West Liberty Patriotic 5K Race/Walk is set for 8 a.m. The starting point is at Lions Park, and registration starts at 6:30 a.m. at the South Shelter. Registration costs $20. Strollers and leashed pets are welcome. Wendy Hepp will sing the national anthem at 10 a.m. at the Town Hall. Afterward, the Kids Art Contest winner will be announced and there will be a patriotic recognition. At Town Hall, the Open Time Capsule and Community Quilt Reveal is at 10 a.m. The time capsule will be unearthed and opened by present and past mayors. The contents of the 50-year-old capsule will be revealed and new items placed into the capsule. The Patriotic History Parade is at noon. The Car & Motorcycle Show will be 1-4 p.m. at Lions Park. A Hog Roast will take place 4-7 p.m. at Shelter House 1 at Lions Park. At the park, live music in Shelter House 1 will be provided by God’s Children Choir at 6 p.m. and The Wild Mustang Band at 7 p.m.
At 3 p.m., the Favorite Local Farmer recognition will be at Lions Park. At 4 p.m., an Aerial Drone Shot will be taken for the community photo at Lions Park. Social Time will be 4-5 p.m. at the park. Bring an outdoor chair. The Millennium Melodears will provide live music at the park at 3 p.m., the Peaceful Strings Dulcimer Group at 4 p.m., and Majesty Quartet at 5 p.m.
A community picnic will be held 5-7 p.m. in Shelter House 1 at Lions Park. At 7 p.m., the Rev. Ron Irick will speak at the Old Fashioned Tent Meeting at the park. Old Fashioned Games are held at the Piatt Castles noon-4 p.m.
At Lions Park, the Mountain Man Encampment will showcase the daily lives of 1840s mountain men. Groups will be dressed in period costumes and will demonstrate archery, hawk and knife skills. The Grove has a photo gallery featuring photo backdrops for Fantastic Photo Fun. Get your picture taken in period clothes and potentially win a prize. The Bicentennial Committee is selling souvenirs at The Grove. The Bicentennial Celebration Booklet has a Bicentennial Historical Hunt to point out historical spots throughout West Liberty.